“Stuupid Humaan!” the dragon shouted with a deep and growling voice. It shook the chamber and cut in Tonklyn’s ears. He rolled away and scrambled across the floor, frantically looking for any cover he could find. He heard a deep growl and a rasping and retching sound come from behind him then a maelstrom of heat swept him over onto his side. His wide eyes looked at the space where he had just been and saw it engulfed in writhing flames. They spread out from the dragon’s mouth and rushed over the floor in an ever-widening circle of destruction. Tonklyn struggled to his feet and ran. The light of the inferno illuminated the vast room, and he saw some barely discernible objects against a far wall. They might hide him. He ran toward them, his heartbeats pounding with his footsteps. The dragon behind him roared in rage. As Tonklyn ran, he glanced back. The dragon’s head swept across the room, looking for him. One of objects Tonklyn was approaching was a large, low table. He threw himself to the ground in front of it, sliding underneath. Quickly he shuffled his body to be fully under its cover. Only then did he dare to look. The dragon was snorting and sniffing through the flames still burning on the floor and rugs where he had been. Can’t he see me? Didn’t he see me run? Tonklyn scooted himself further under the table, but not so far that he couldn’t see the beast. The dragon swung his head back and forth across the floor, ignoring the fire, and sniffing as he went. “Whhere did youu go?” it rumbled. Finally it raised its head and roared in a fury, “I WILLL killl you!” It reared back on its back legs and flexed its wings, while snaking its neck high into the upper reaches of the chamber. The motion of its wings fanned the flames below. Tonklyn felt a hot wave of pure terror rush over him. It tensed his back and shook his legs. He clenched his teeth to force himself not to release the scream he felt deep in his gut. He lay flat and hid himself in his arms, trying to become as small as possible in the dark under the table. 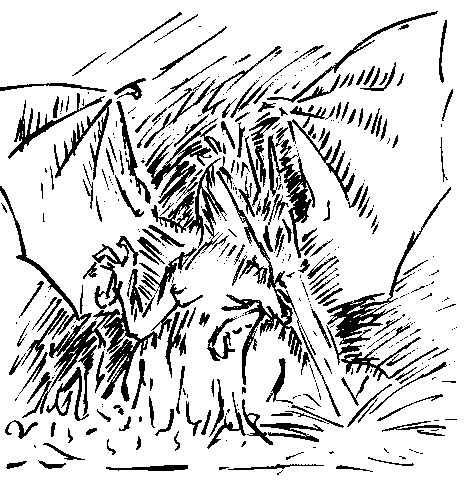 He looked again, and dragon fell to his forelegs, smacking the ground with a shaking impact. It stretched its neck forward and Tonklyn saw its chest and belly shake, as if it was churning up something noxious deep inside. It closed its eyes, then retched and hacked more flames from its maw, sweeping back and forth across the room. Cushions, rugs, and tapestries in the room became covered in fiery spit. Smothering, painful heat washed over Tonklyn, making it difficult to see or breathe. The dragon raised its head, hot flaming drool running down its lower jaw and dripping onto the already burning floor. Tonklyn didn’t dare move, and tried not to breathe. Was all that sweat from fear or the heat? Tonklyn found himself strangely fascinated by the dragon’s speech. He wondered how the humongous monster had learned common tongue. His heart was still pounding, but his mind was clearing. It shapes the words strangely. It must have learned it by study, not by interaction with humans. Tonklyn crept forward a few inches. The fires still burned, but not as fiercely. The glow from the floor and walls lit the dragon from below and behind, giving him an awesome and even regal look. Tonklyn found himself transfixed. After all the years of reading about them, I finally actually get to see one! He studied the lines and shapes of its neck, wings, back and legs, vowing to sketch it accurately for the record. If I live, that is. Well, if it can talk, then I can negotiate with it. He thought back on all of those years he had spent stroking the inflated egos of the sages in the library. That should help for something, shouldn’t it? But it’s right when it says it will find me eventually, anyway. It’s going to kill me. It will eat me alive. My wits are my only hope. Tonklyn took a deep breath, for courage, then coughed out the smoky air. He slowly crept out from under the table and stood up. The heat from the fires all around him was painful, almost unbearable. Sweat ran down his neck in streams. Hands at his side, unthreatening, he raised his head to look at the gigantic dragon’s face. It drew back slightly, narrowing its eyes. If it could have shown a smirk of surprise, that would have been it. The dragon lowered his head and neck to within a few scant feet of Tonklyns chest, where his heart was palpitating with terror. The head was easily big enough bite him in half and swallow each part whole. Its breath intensified the heat around him. Tonklyn fought the instinct to break, to step back, or even to run, screaming, into the dark. Instead, he bowed his head, briefly, put on his most diplomatic face, then looked the dragon steadily and directly in the eyes. “Whoo arre youu?” the dragon finally said. “I am Tonklyn. A scholar. An apprentice to the sages of the great library of King Twynnham of Twynne Rivers.” That much is true, anyway. Now he’s intrigued. I’m on my way in. “I have been studying the reign and fall of the Great Dragon Kings, particularly Maxinn III. I found the records of this place, his palace, and I resolved to seek it out. What better way to learn of the King, than in the palace itself?” Still, all true. Mostly. He tried to hide his nerves by walking back and hiking himself up to sit on the table, his legs casually crossed before him. Tonklyn breathed in, coming out of his memories. He rested his head on the pillow of the bed in the Inn. After they had arrived at Twynne Rivers, they had easily found fine accommodations. With enough gold, things happen quickly. The room was warm and dark, the bed was soft, and the sheets were smooth. Twynne Rivers may look like nothing here has changed, but everything has changed for me.